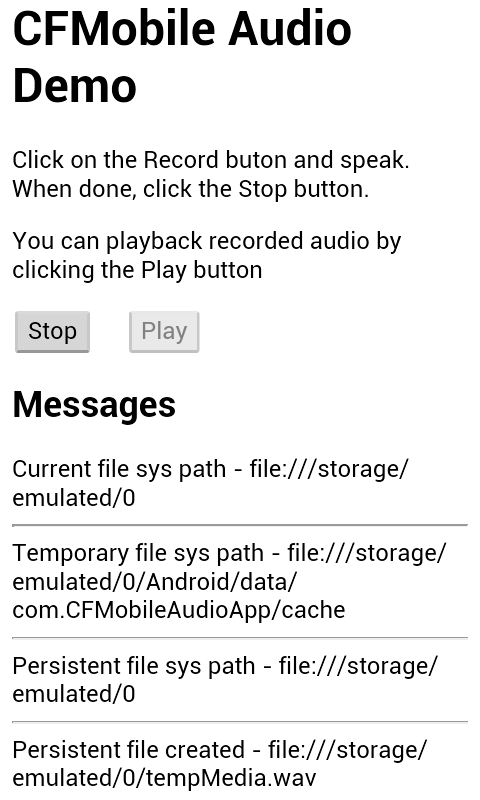 In this post I am going to show how easy it is to record audio and play it back in a mobile application using ColdFusion Splendor. If you haven’t already, you can download it from Adobe Labs. I have tried to keep the application simple. There are two buttons, Record and Play. 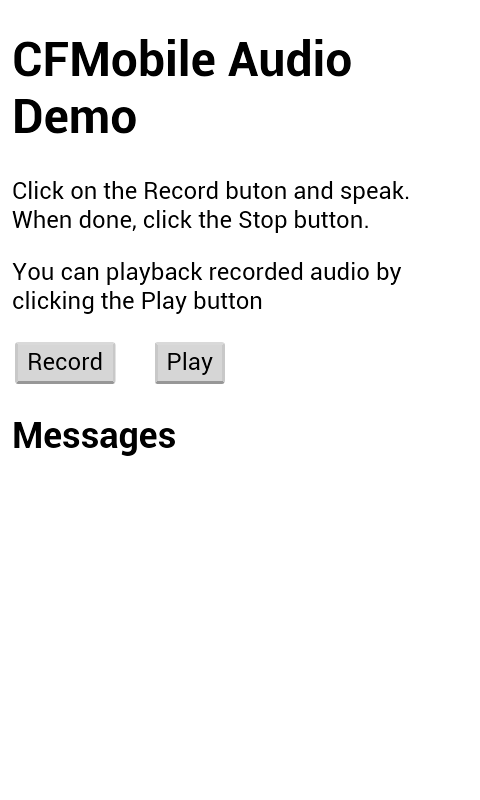 When you click Record button, the recording starts and the Stop button is displayed. Speak into the phone microphone to record your voice. When done, click Stop button. You can play back the audio by clicking Play button. You can also stop playback any time by clicking Stop button. Though ColdFusion Thunder is the next version of ColdFusion Builder (the last version was 2.0.1), it is like a new IDE because it’s a major re-write. Past versions of ColdFusion Builder were built on top of Aptana. I had noted some of the challenges in implementing ColdFusion Builder a couple of years back, when CFB 2.0.1 was released. 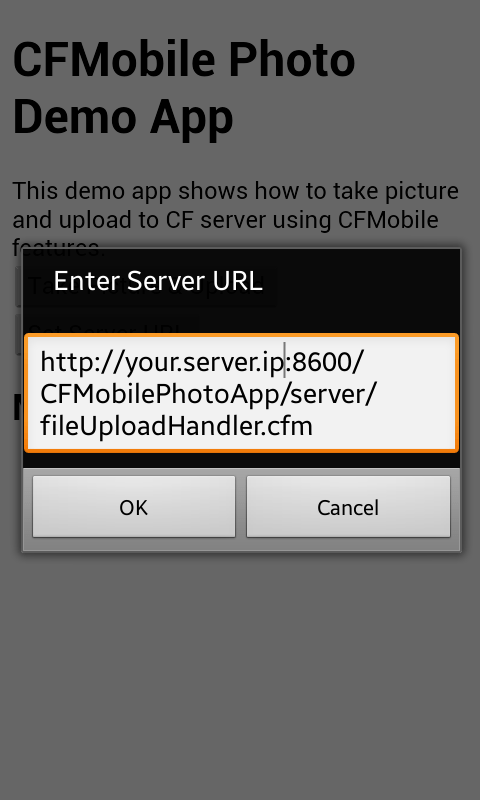 The task was huge and we, in the ColdFusion team, had been working very hard during the past two years to – first build all (or most) the features of CFB 2.0.1 in Thunder, and then to add some more features. If you have used ColdFusion Builder in the past, then you will see great performance improvements in all the editors in Thunder. Specifically you should see difference when editing large files. The memory footprint is also improved. 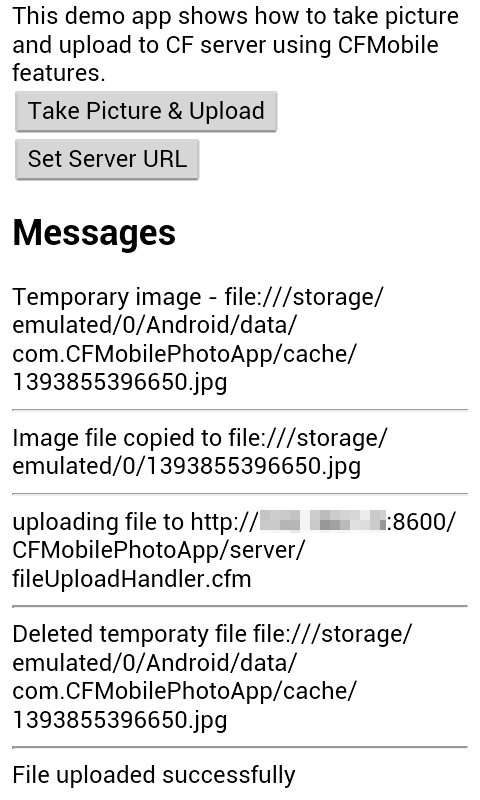 I was going to cover a use-case of taking picture in a mobile app and uploading it to ColdFusion Server in this post, but I found some issues in packaging an app that used Geolocation APIs when helping someone and thought that I would cover geolocation first. The day 1 of CFSummit2013 was great. It started with Ben Forta’s keynote. It was, as expected, excellent. He talked about the history of CF, how it’s goal is still the same (productivity) and which features have worked really well and which ones did not work. It was followed by Rakshith’s demos of some of the new features in the next release of ColdFusion (code named Splendor). He touched upon language enhancements, improvements in PDF generation and Mobile features. My demos of mobile features followed Rakshith’s demos. Unfortunately by the time I walked up to the stage to present demos, we had almost ran out of time. So I had to rush through my demos. 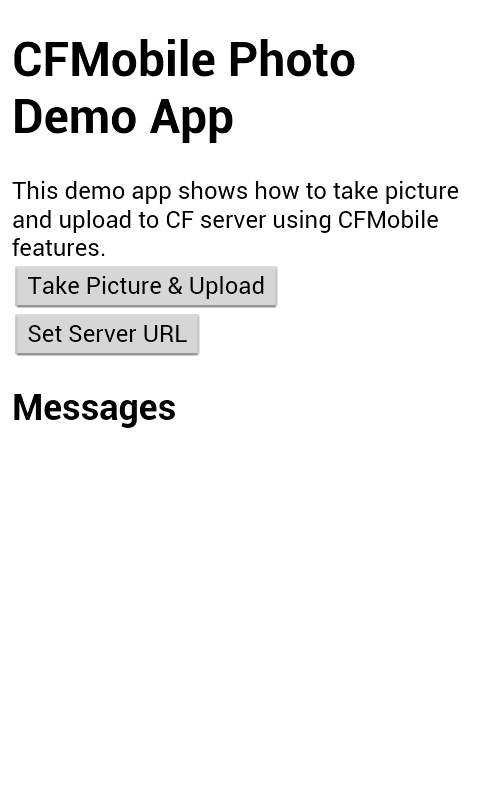 I had planned to show a demo of debugging mobile application running on a device using ColdFusion Builder, but could not do so. I was told that there were a few issues with audio and display screen during the keynote. Adobe had set up a table where CF developers could meet and talk to CF team members. Many attendees came there and showed interest in the mobile work flow that we had presented. I also attended Simon Free’s session on Mobile development features in Splendor. He did an excellent job of explaining what cfclient is and some of its features. In the limited time that we had in keynote, we probably could not explain what cfclient was, but I think after Simon’s session people got pretty good idea of what it is. I am looking forward to the second part of Simon’s talk today. 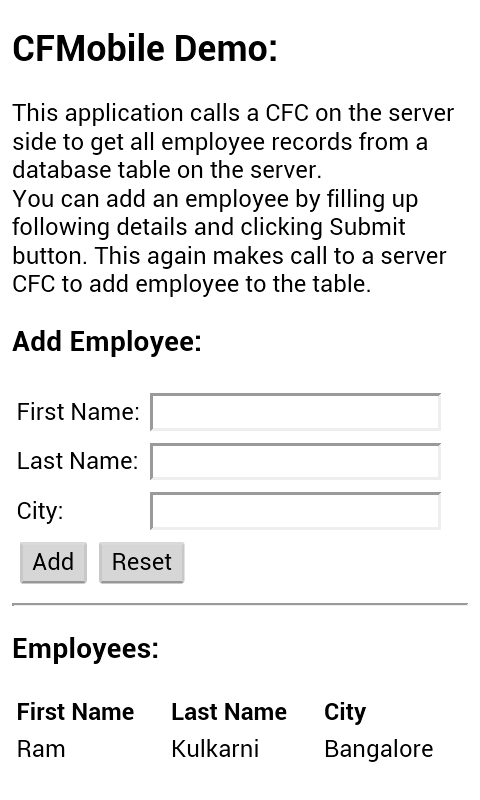 ColdFusion 10 and ColdFusion Builder 2.0.1 released this week, on 14th May. My article on What’s new in ColdFusion Builder 2.0.1 is published on the Adobe Developer Connection. I have been working on ColdFusion Builder for close to 3.5 years now and the release of updater this week has put me in a mood to reflect on challenges we have faced so far.